Island in the West Indies, now constituting a French colony. In the beginning of the seventeenth century a number of Dutch Jews settled at Martinique and in the neighboring islands, and were in very prosperous circumstances when France took possession of the island in 1635. But in 1658 the Jesuits, jealous of the commercial supremacy of the Jews, induced the sovereign council of Martinique to issue an edict forbidding Jewish commerce in the islands. At the instance, however, of the home authorities the council revoked this decision, which menaced the interests of the colony, and consented to restore the Jews to their commercial rights. This freedom was of short duration. In 1664 Governor-General Tracy was induced by the Jesuits to issue a decree forbidding "persons of the Jewish nation to buy or sell on the Sabbath-day [Sunday] . . . on pain of a fine of 300 pounds of petun, of which one-third shall go to the church, one-third to the poor, and one-third to the informer." The Jews thereupon appealed to the new governor, Baas, who restored to them the free exercise of trade and commerce. Their enemies then approached the governor, who, yielding to their importunities, forbade (1669) Jews "to perform on Saturday any ceremonies relating to their faith, . . . to work on Sunday, or to appear in public from Maundy Thursday to Easter Sunday." But, like his predecessor, Baas soon perceived the importance of Jewish commerce and industry and sent Colbert a report favorable to the Jews, requesting certain privileges for them, especially that of the free exercise of their religion. Colbert pleaded the cause of the Jews so well before the king that on May 23, 1671, Louis XIV. decreed that the Jews of Martinique should thenceforth enjoy not only religious liberty but also the same privileges as the other inhabitants. During the life of Colbert all hostile schemes against the Jews failed, despite the powerful support which their enemies found in Count de Blénac, who had succeeded Baas as governor. But with Colbert's death they lost their protector, and the governor, yielding to the Jesuits, on Sept. 24, 1683, during a visit to France, obtained from Louis XIV. 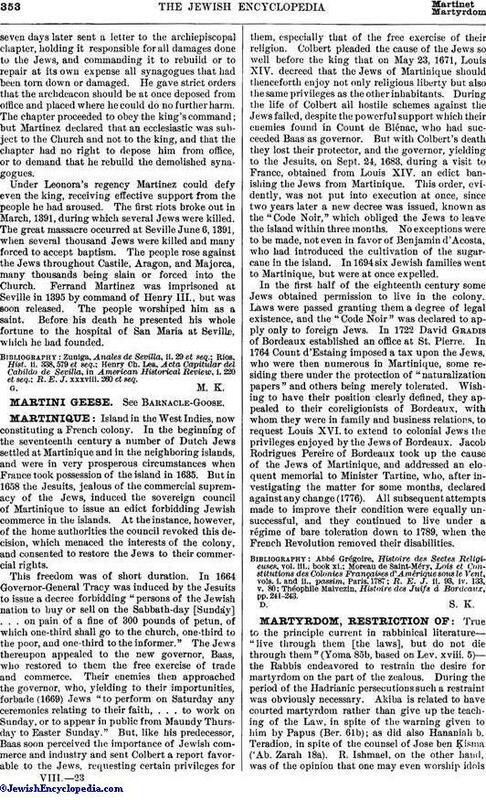 an edict banishing the Jews from Martinique. This order, evidently, was not put into execution at once, since two years later a new decree was issued, known as the "Code Noir," which obliged the Jews to leave the island within three months. No exceptions were to be made, not even in favor of Benjamin d'Acosta, who had introduced the cultivation of the sugarcane in the island. In 1694 six Jewish families went to Martinique, but were at once expelled. In the first half of the eighteenth century some Jews obtained permission to live in the colony. Laws were passed granting them a degree of legal existence, and the "Code Noir" was declared to apply only to foreign Jews. In 1722 David Gradis of Bordeaux established an office at St. Pierre. In 1764 Count d Estaing imposed a tax upon the Jews, who were then numerous in Martinique, some residing there under the protection of "naturalization papers" and others being merely tolerated. Wishing to have their position clearly defined, they appealed to their coreligionists of Bordeaux, with whom they were in family and business relations, to request Louis XVI. to extend to colonial Jews the privileges enjoyed by the Jews of Bordeaux. Jacob Rodrigues Pereire of Bordeaux took up the cause of the Jews of Martinique, and addressed an eloquent memorial to Minister Tartine, who, after investigating the matter for some months, declared against any change (1776). All subsequent attempts made to improve their condition were equally unsuccessful, and they continued to live under a régime of bare toleration down to 1789, when the French Revolution removed their disabilities. Théophile Malvezin, Histoire des Juifs à Bordeaux, pp. 241-243.